Whoa! Wait a minute, here--don't we buy products with ANTI-bacterial properties to prevent skin problems? Are you telling me that the very thing I try to avoid is actually GOOD for my skin? Yes--IF the bacteria is GOOD bacteria. Good bacteria, also known as "pro-biotics," has been used to promote good digestion and therefore enhance the immune system. You've seen the ads for DanActive, YaKult, Activia--food products containing active cultures of pro-biotic bacteria. Now, pro-biotic benefits can be found in our skin care in the form of a 3 billion year old micro-organism called "thermal plankton". A research study conducted at Stanford University concluded that Pure Thermal Plankton closely resembles the pro-biotics contained in yogurts but instead of strengthening the intestines, it strengthens the skin's natural defenses. 1. The packaging - Actually, the packaging is very classy. Very clinical and modern. I would have preferred that the day, night and eye creams were in tubes or pumps instead of jars for more sanitary application. Otherwise, it's all good. 2. The fragrance - It's not overwhelming, but there's a bit of fragrance to the day and night creams and the exfoliant. Being sensitive to fragrance, I would have liked all the products to be fragrance-free like the eye treatment, but overall it wasn't enough to affect me adversely. Okay, that's what I did NOT like about the products. What I DID like: EVERYTHING else. The Rides Repair Instant Polish is a fine-grained exfoliant that gently sloughs off dead cells leaving skin smoother and more even-toned. 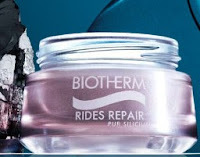 The Rides Repair Eye treatment is a light cream that absorbs easily and makes the eye area look younger and reduces the appearance of fine lines. The Rides Repair Day cream is rich and hydrating without leaving skin feeling greasy or blocking pores. I love everything else about these products: the texture, the quality, the effectiveness. Most importantly, the effectiveness--this stuff works! It ROCKS!!! After just one application, I woke up with skin that looked awake and refreshed. Healthy, hydrated, happy. Happy skin equals happy ME! So for optimum health, make sure you get your daily dosage of GOOD bacteria-- both inside and out!